This week, I babysat a friend’s granddaughter and I overheard a conversation between her and my youngest which left me nearly bent over with laughter. My daughter quickly responded, “She’s not. She’s as big as she can get. Now she’s just gonna get shorter, fatter, and uglier.” I don’t know where she got that notion, but I clearly have much to look forward to in her 9-year-old opinion :-). I couldn’t help but consider though that, sadly, many of us see ourselves in just such a negative light, calling “ugly” what God called “very good”. As a result, we often pass this same skewed perspective to our children. Whether we find fault with our skin, hair, weight, or other feature, it seems we’re never truly happy with what we see in the mirror, so we work feverishly to color over, cut into, or cover-up every perceived flaw, never attaining the contentment we hope it will bring. 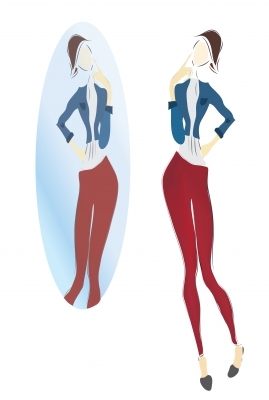 Believe it or not, it is possible to break free from a negative self-perception and make peace with your mirror image! It’s a process that doesn’t happen overnight–for me it was a long one but somewhere along the journey from age 15 to nearly 45, I became comfortable with my 5 foot stature, unruly hair (and matching eyebrows), freckled skin, and extra curves. 1- Stop seeking perfection, which doesn’t exist, and start seeking health which is vital. A healthy body, mind, and spirit converge to create genuine beauty that others are drawn to. 2- Eat well, exercise, rest, and play. A healthy routine means a healthy mindset which generates a more accurate perception of yourself. 3- Refuse to buy into media-defined ideals of beauty which are fluid and cultural. Instead, set a personal standard that is based on truth and reality rather than shifting public opinion. 4- Stop comparing—it either makes you feel inferior which is unattractive, or it makes you feel superior which is also unattractive. 5- Break the tie between beauty and self-worth. Internalize once and for all this statement, “I am not the sum total of my body parts.” Period. 6- Count blessings, not flaws. Keeping a grateful journal will truly transform your perspective and your life. Thankful people are happier people. (See Gratitude, Not “Attitude”– 7 Ways to Teach Thankfulness). 7- Get rid of everything anyone but God says about you. It doesn’t matter who said you were too fat or too skinny, too short or too tall. God, who never changes and is not fickle, says you are “fearfully and wonderfully made” (Psalm 139:14). 8- Surround yourself with positive people. It’s contagious. 9- Recognize that your body is an instrument, not an ornament. It is meant to be used to bring hope, healing, and love to those around you, not to be draped and put on display. 10- Celebrate aging and the future rather than live in the past which you likely weren’t happy with anyway. I’m not a 20-year-old size 2, but I wasn’t happy with myself when I was. Nearly 25 years later and so not a size 2, I look back and wonder what my problem was. But then, in another 25 years, I’m likely to look back and wish for what I have today. So why not just enjoy where I am right now and look forward to where I’m going? I’m grateful to have made peace with the mirror, although I occasionally have to remind myself that the lines around my eyes are evidence of years of laughter. My wrinkled brow is a reminder of unnecessary worry as God has brought me through every trial that caused those deep furrows. Each scar and bump on my body tells a story of hard work or hard play. My hair is graying quickly, but then, my eyesight is fading just as quickly which means I can’t tell what’s blond and what’s gray anyway, so I suppose it doesn’t matter :-). How about you? Is the mirror still your enemy or have you called a truce? What do you do to remind yourself that you are a treasure no matter what your reflection says? This entry was posted in Healthy Living, Moms and tagged aging, body image, breaking free, Health, loving your looks, mirror image, self-esteem, self-image, self-worth by Rita Clucas. Bookmark the permalink.